In the olden days of Aladdin’s Lamp there were magic carpets to help us find our way and comfort us on our journey. Carpets that would fly and carpets on which you could ride, nap, read a book, or just relax with your dog. 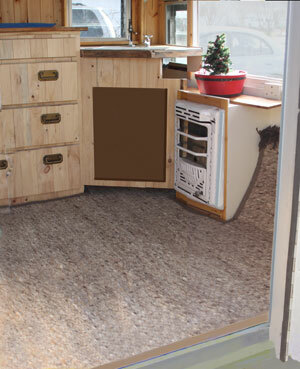 Last month I unexpectedly found the perfect carpet for my little, 1958 camper trailer: Luciee. A hand-knotted, imported (from the middle east) llama wool carpet captured my imagination—I just had to have it. There was a small problem though, it was simply too large for my trailer floor space and needed to be cut and bound to fit around various obstacles on Luciee’s floor while maintaining its inherent handwoven beauty. This presented a unique challenge since I didn’t want the carefully hand-knotted rug to ravel out, leaving me with a pile of fluffy but useless llama wool! I don’t have much experience or knowledge about binding hand made rugs, especially a rug like this one—thick, soft, comfortable and hand-tied. After some research though, I found the perfect craftsmen who would definitely be up to the task— Armel Enterprises. The carpet looks and fits so great! Armel Enterprises has been in business in Virginia Beach, Virginia since 1971. Its name is derived from the husband and wife team founders, Arlene and Mel Losick, who now employ the management, people and carpet skills of their son, Heath and his wife, Beverly. They specialize in binding and serging (stitching) carpets, bringing artistry and fine old world craftsmanship to each project. Heath and Beverly are also artists of the music world, as well. Heath plays the trumpet, and Beverly, originally from Australia, plays both the trumpet and the French horn. These two make sweet music together throughout Hampton Roads, VA as part of the group, Symphonic Artistry. Their mission is to perform fine music and to instill the importance of music into today’s youth through musical mentoring and internship programs. You may visit their website at www.SymphonicArtistry.com. Combining multi-generational talents, this family business brings the skill and dedication necessary to provide knowledgeable and caring service. I put my prize carpet in their capable hands and couldn’t be happier with the result created by my carpet magicians from Armel! Visit the Armel website at www.armelcarpet.com. Learn all about carpet construction techniques and the services this fine company has to offer Hampton Roads homeowners. So good to know there are still some craftsmen around who take pride in their work.